Live a life free from acne and acne scarring. Struggling with Acne? Fret not, The Women’s Clinic has a 3-Step Process to remove Acne and Acne Scarring. First, we take a skin scan, apply an anti-bacterial intense pulsed light (IPL) treatment and add an anaesthetic cream. Next, we perform our CO2RE fractional laser treatment. Finally, to prevent further skin issues, it is vital to implement the correct homecare plan (aka acne treatment products and fash wash). Acne is a common inflammatory condition of the skin that is producing red inflammatory spots, blackheads and whiteheads appearing on the face, chest, and back. We get acne when the pores of the skin are clogged with oil, dead skin cells, and bacteria (propionibacterium acne) that get trapped inside. Acne can present in many different ways; from small blackheads to large inflamed lumps (pustules filled with pus) or cysts. 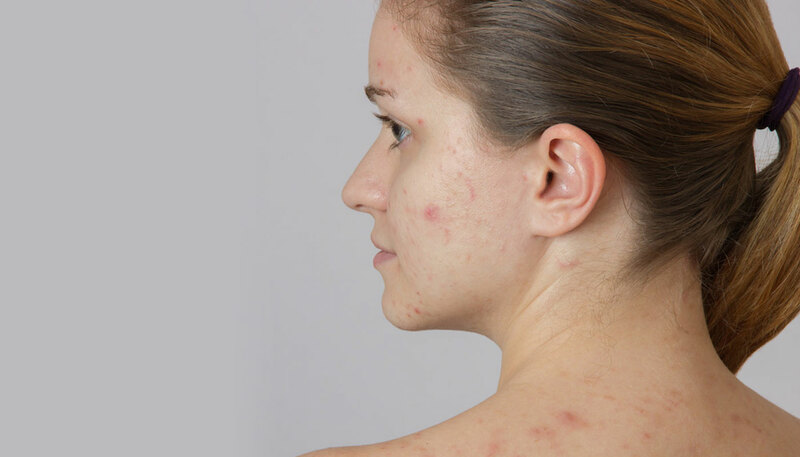 Acne usually runs chronic course with either persistent symptoms or recurrent flare ups commonly treated by you doctor with courses of oral antibiotics, topical creams, gels and hormonal contraception for women. Chronic untreated inflammatory acne lesions ( red lumps and cysts) lead to formation of permanent scars. Acne scars are permanent textural changes and indentations that occur on the skin as a result of severe acne. The term “acne scars” is not used for the temporary red and brown marks left early after acne has occurred as these marks will almost always improve without treatment. In severe acne, large pus-filled spaces known as acne cysts are formed. These cysts destroy the normal architecture of the skin tissue which is not replaced during the healing process. When the cyst eventually empties and the area heals, it usually leaves behind an indentation (or scar) on the face. On the chest and back the scarring can be lumpy (known as “hypertrophic” or “keloid” scarring). The fractional CO2 (carbon dioxide) lasers offer an effective treatment of acne scarring. The new “fractional” technology treats only a portion of the skin, leaving healthy intact skin surrounding the treatment area. This allows for fast healing and very safe treatments for all skin types. The fractional CO2 laser makes small microscopic holes in the deeper layers of the skin. This process leads to the generation of new, healthy collagen to smooth out the acne scars. Improvement in acne scars can be seen in as early as one week following the fractional CO2RE laser treatment and it will continue for up to 6 months following the initial treatment. Approximately 30-70% improvement of acne scarring is seen after one treatment, though results vary by the individual. Many patients require only one treatment to reach the desired improvement. At The Women’s Clinic we provide a professional and high quality service carried out by experienced laser and medical practitioners. During the consultation we will carry out a full skin assessment and photograph each patient pre and post treatment to demonstrate the success of the skin treatments. Is CO2RE treatment of acne scars suitable for darker skin types ? Fractional CO2 laser treatments are safe for the treatment of acne scarring in darker skin types. All skin types, including Asian, Indian and African-American skin, can be safely treated with the fractional CO2RE laser. Hyperpigmentation is a term describing areas of uneven pigmentation in the skin often called “age spots” or “sun spots”. It is caused by an increase in melanin and refers to darker-coloured patches of skin that can appear on the face, hands, décolletage, neck and shoulders as well as other areas. Melanin is the natural pigment that gives our skin, hair and eyes their colour. A number of factors can trigger an increase in melanin production, but the main ones are sun exposure, hormonal influences, age and skin injuries or inflammation. Hyperpigmentation caused by sun exposure often occurs 10-20 years after the initial damage, and so sun spots showing on your skin now may well have been caused when you were in your teens or when you were a child. Age spots can make your skin look much older than your age. Hyperpigmentation in younger women might be triggered by hormonal changes during pregnancy or from the contraceptive pill. How does CO2RE improve hyperpigmentation? Sun induced, hormonal and post-inflammatory hyperpigmentation can be successfully treated with CO2RE resurfacing treatment and with specialist home-care. The laser removes the superficial layers of damaged skin and stimulates the growth of the new skin cells. This results in reduction of unevenly distributed pigment, improvement of the skin texture, tone and healthier, even complexion. They're very common and can vary in colour and size – from a few millimetres up to 5cm (about 2 inches) wide. However, you may consider having skin tags removed if they're affecting your self-esteem, or if they snag on clothing or jewellery and bleed. Skin tags can be removed by freezing, cutting off with a surgical knife or laser. The laser removal is by far the fastest, safest and most precise way of eliminating skin tags without any bleeding or other complications, while allowing to achieve the best cosmetic result. For removal of larger skin tags local anaesthetic can be used. Warts are small lumps that often develop on the skin of the hands and feet. Warts vary in appearance and may develop singly or in clusters. Some are more likely to affect particular areas of the body. For example, verrucas are warts that usually develop on the soles of the feet. Warts and verrucas are caused by a virus. Warts don't cause you any harm but some people find them painful, itchy or embarrassing. Verrucas are more likely to be painful – like standing on a needle. You can get rid of them using various topical treatments for warts such as creams, plasters or sprays. It can take up to 3 months, they can irritate your skin and don’t always work. Other available treatments for large or “stubborn” warts are freezing, cautery or treatment with laser. Neither freezing or cautery has the precision and safety margin offered by laser. CO2RE laser beam can be directed to the treated area with a great precision leaving the surrounding healthy skin intact. Essentially it burns the wart, which turns it’s colour from grey to black before falling off within one or two weeks.The wart is subsequently replaced by new, healthy, smooth skin and within weeks or months the area looks like the wart has never been there. For larger lesions if needed the treatment can be repeated after 4-6 weeks. The procedure is well tolerated and produces an excellent cosmetic result.